Trove is an online search engine developed by the National Library of Australia. At the click of a button, you can access a large and unrivalled repository of Australian material. Browse for historical & current newspaper articles. A great source of contemporaneous material. There are also digitised versions of various magazines, e.g. The Australian Women's Weekly (1932 - 1982). This program gives students a good overview of how Australia's six squabbling colonies peacefully united to form one country. A journey around Australia as each state and territory is examined in turn. The colonial history of Australia, and how this led to the formation of the states with the advent of federation is investigated. The history, physical geography, climate and weather patterns of each state are examined, as well as land use and population density. We also look at the major industries in each region, and the importance of the mining and agricultural industries to the nation as a whole. As we follow the development of Australia's white history in this period, we trace the growth of a colonial community into a proud new nation. A documentary history of the Federation movement from 1880 to 1901. 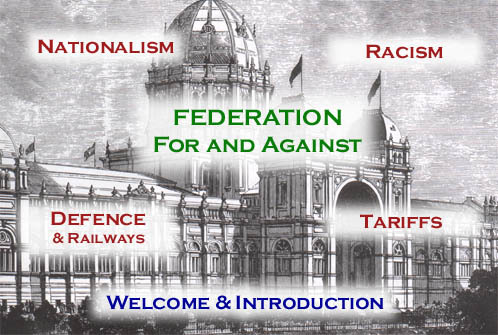 The site examines the arguments for and against Federation, nationalism, racism, tariffs, defense and railways. Includes image gallery and timeline. This National Library of Australia site has a timeline and a resources section for online information. The exhibition section of the site has two exhibits: Federation: A Slice of Life (includes health, fashion and events) and Belonging. The People section includes biographies of important participants at the time. Vrroom is an ever-growing set of records from the National Archives collection. Areas covered in this topic are federation, the constitution and citizenship. An online exhibition from the Australian Maritime Museum which demonstrates how particular events in Australia's history are associated with Federation. It examines how involvement in World War I shaped Australia.